Disclaimer: the following post is not a full solution. It is just a series of very simple examples showing how to implement message broadcasting. A production grade solution may look very similar (just as simple as this, in fact), but with one critical difference: security. I left security out of the examples to focus strictly on how to broadcast notifications. DO NOT IMPLEMENT THIS SOLUTION WITHOUT FIRST SECURING THE CLIENT CONNECTIONS!! I give some security ideas at the end of this post. In the OTN forums, a customer recently asked how to push notification messages from the server to logged in users. It is a good question, and it's one I have heard before. For example, let's say you are an administrator and you want to push out a message telling all users that the system is going down for maintenance in 15 minutes. This is a tricky issue because it stands in contrast to the protocol chosen by modern enterprise applications: HTTP(S), also known as "the web." Through the web, client browsers connect to servers and then disconnect. Servers don't connect to clients, and clients don't hold connections open while waiting for a constant stream. This is what makes the server side message push challenging. How can a server push a message to a disconnected client? Some very smart people have come up with a few answers with long polling and WebSockets being the most common. The next question: How can a PeopleSoft developer implement this type of solution? It would be possible to implement a long polling solution using an iScript (I don't recommend this, but let me explain it anyway). With this approach a browser makes an Ajax request to an iScript and the iScript sleeps, loops, and does whatever it can to avoid responding until it has something to send back to the client. In this case, the iScript would wait until a database table contained a message, and then it would send that message back to the client. The client would process the message and immediately create another connection to the server. Here is why I don't recommend this type of solution: the PeopleSoft Internet Architecture (PIA). 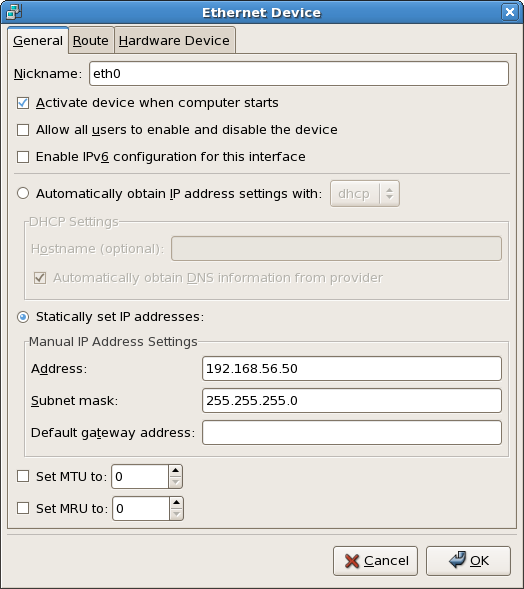 PIA is designed to perform well in a disconnected state. Connection pooling, etc. work well when disconnected. Changing the client's behavior by maintaining a persistent connection to PeopleCode running on the app server pretty much invalidates the use of a connection pool. Running this type of connected service would require a dramatic increase in app server connections. 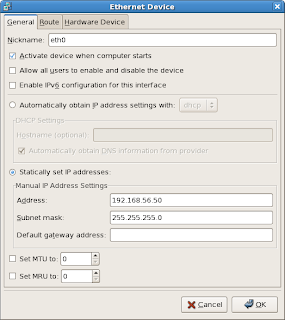 This would require one app server connection for each logged in user PLUS a pool of stateless connections to be shared by normal PIA clients. The app server pool is generally smaller than the maximum number of expected connections because no one expects every client browser to connect at exactly the same time. Using iScript based long polling, however, would dramatically increase that number. If anyone has other experiences, please share them. Don't use document.write. The document.write method assumes the browser is still parsing the original document. In the modern Ajax world, that may not be true. Here is a node.js example. It broadcasts a message every 5 seconds, just for testing purposes. Security varies widely between PeopleSoft implementations, so I'll leave that up to you. One customer might choose to authenticate the "master" client using a simple hard coded username and password. Another might use encrypted keys, pass phrases, or even digital certificates. Another option would be to use a PeopleSoft web service to authenticate users based on the user's PS_TOKEN cookie. 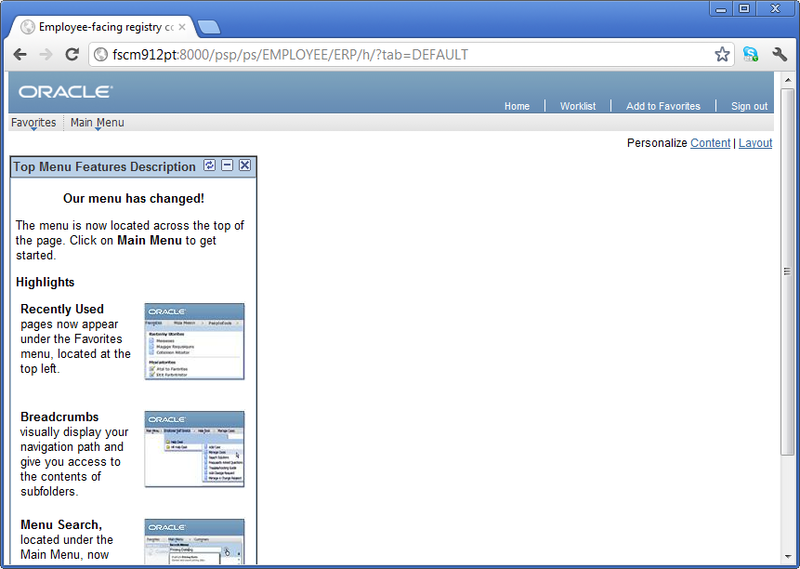 If the user is a member of the PeopleSoft Administrators group, then that user would be allowed to send messages. Whatever you choose, just do something! The sample chapter for my PeopleTools Tips and Techniques book (Chapter 3) contains all of the steps required to add AWE to a PeopleSoft transaction. A colleague who recently used this chapter to AWE enable a transaction asked me how to mass approve transactions. Most of the code required to mass approve transactions is actually on the last page of Chapter 3. Here is an expanded template with placeholders. Just wrap this in a loop and wire it up to a button, App Engine, or some other execution environment. Each time through the loop, update the header record values, acquire a new instance of the ApprovalManager, and execute DoApprove. 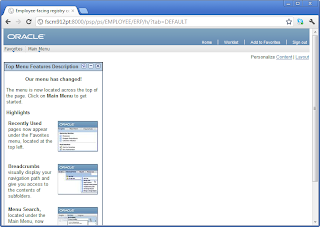 Several years ago I wrote the post Query for Component and/or CREF Navigation which demonstrated how to use Oracle's connect by clause with the portal registry to find the navigation to a PeopleSoft component. Why? Most users are trained to send a Ctrl-J screenshot to their developers when they encounter issues. Knowing the menu, market, and component is great, but developers need to know the navigation in order to replicate the issue. The point of the query is to find the navigation to some component or CREF without having to ask a functional expert for more details. As of 11gR2, Oracle now supports recursive common table expressions, a T-SQL feature supported by Microsoft and DB2. Here is a new iteration of that old post that uses Common Table Expressions. For those using non-Oracle databases, be sure to update the concatenation character to match your database platform. If you use this SQL within PeopleSoft (as a view, etc), then save yourself some potential grief and use the %Concat Meta-SQL variable instead of a database specific concatenation operator. I've seen a few forum posts that show how to zip files using both Exec and the XML Publisher PSXP_RPTDEFNMANAGER:Utility app package. Those are great options, but might not fit every scenario. Since the Java API includes support for zip files, let's investigate how we can use it to create or extract zip files. The contents to zip doesn't have to come from a static file in your file system. It could come from the database or... well, anywhere. Here is an example of zipping static text. In this example I intentionally left the internal zip file path (folder) blank to show how to create a zip file with no structure. And, finally, unzipping files. The following example prints the text inside each file from a zip file named "compressed.zip" that contains four fictitious text files named file1.txt, file2.txt, file3.txt, and file4.txt. What about unzipping binary files into the file system? I'll let you write that one. Password protected zip files? Java doesn't make this easy. There are a few Java libraries, but as Chris Rigsby points out here, using non-standard Java classes (including your own) can be hazardous. At this time, it seems the best way to password protect a zip file is to use Exec to call a command line zip program. On Linux with the zip utility, use the -P parameter to encrypt with a password. If you have my book and I haven't signed it, bring it (only if you want, of course)! I'm happy to sign books at any time. 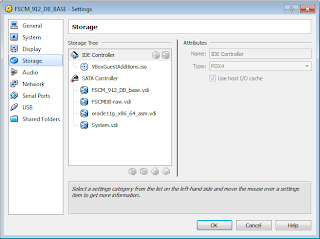 This post assumes you already have a working database as described in Converting PeopleSoft OVM Templates to VirtualBox Guests or some other PeopleSoft PT 8.52.03 database. It also assumes that you have the cloned starting point of a base OEL with the OVM functions (steps 1 through 22 from the prior post). Run through steps 1 through 3 as listed here. Notice that step 3 gives the PT image the IP address of 192.168.56.51. Update your network settings and hostname to match the /etc/hosts file and make sure it matches what is in the db image. * Special thank you to Nicolas Gasparotto for his Installation Documents. My first handful of times through the script, my app server wouldn't start. I found three issues: TUXDIR, LANG, and PATH. TUXDIR and LANG are both documented in various places on Nicolas's blog. The scripts will generate an app server domain named APPDOM and a process scheduler domain named PRCSDOM. If that is not preferable to you, then edit /opt/oracle/psft/vm/oraclevm-template-utils.sh. Search for APPSRVDOM=APPDOM AND PRCSDOM=PRCSDOM. Replace APPDOM and PRCSDOM with your preferred values. I just accepted the defaults. Here is the output my system generated when I ran the script. My answers to prompts are in bold. are connecting to a Database that has been used before you may wish to skip this step. Log Directory entry not found in configuration file. Spawning disabled for server PSAPPSRV. WARNING: PSSAMSRV is configured with Min instance set to 1. To avoid loss of service, configure Min instance to atleast 2. WARNING: PSSAMSRV and PSQRYSRV are configured with Min instance set to 1. To avoid loss of service, configure Min instance to atleast 2. Attaching to active bulletin board. Process Scheduler Server configuration created. Spawning enabled for server PSDSTSRV. WARNING: PSDSTSRV is configured with Min instance set to 1. To avoid loss of service, configure Min instance to atleast 2. Process Scheduler Server configuration complete. which the Application Server domain will listen for incoming connections. No activity will be logged to this window. same VM. This means that some additional automated setup can be done. multiple tiers in the same host. If you want to App Designer to connect in 3-tier, then: #1 become psadm2 (sudo -u psadm2 -i), #2 psadmin, #3 configure the domain and turn on option 6, #4 restart the domain. 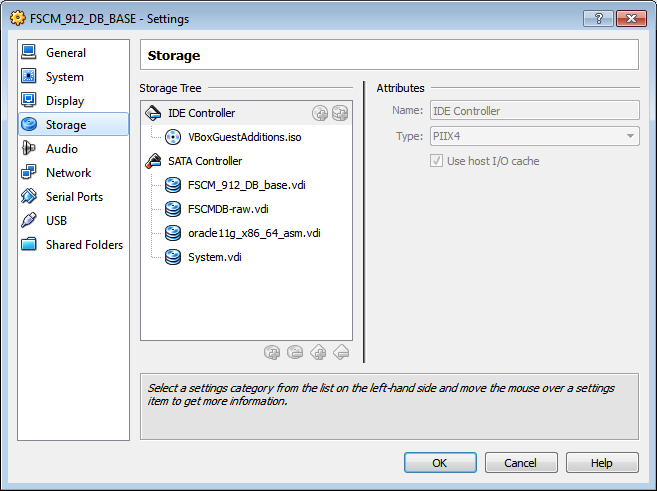 Add an entry to your Windows hosts file (c:\windows\system32\drivers\etc\hosts) to point to your VBox guest. When all was said and done, I logged into my PeopleSoft instance, ran XFRWIN, and watched it post. If you used the same names as I did, your server will be running at http://fscm912pt:8000/ps/signon.html. Seriously, this was the fastest install ever. I didn't have to install Tuxedo, Oracle client, Weblogic. I didn't have to configure report nodes, pub/sub, etc. The script took care of everything. So what next? I was thinking it would be really cool to run these images in lxc. According to this post, Oracle has all the scripts, etc to run OVM images in lxc. Perhaps it can run the JeOS images created by the PeopleTools team?